"The man was highly intellectual [...] and also [...] fairly well-to-do within the last three years, although he has now fallen upon evil days. He had foresight, but has less now than formerly, pointing to a moral retrogression, which, when taken with the decline of his fortunes, seems to indicate some evil influence, probably drink, at work upon him. This may account also for the obvious fact that his wife has ceased to love him." -- example of abductive reasoning by Sherlock Holmes in the "The Adventure of the Blue Carbuncle"
Sherlock Holmes is a fictional detective of the late 19th and early 20th centuries, who first appeared in publication in 1887. He is the creation of Scottish author and physician Sir Arthur Conan Doyle. A brilliant London-based detective, Holmes is famous for his intellectual prowess, and is renowned for his skillful use of "deductive reasoning" while using abductive reasoning (inference to the best explanation) and astute observation to solve difficult cases. The word Sherlock has since entered the English language as to mean someone who is both highly intelligent and observant. It is also used sarcastically to mean someone who states the obvious. Holmes archenemy, the master criminal Professor Moriarty, called "the Napoleon of crime" — a character believed to have been based on legendary London criminals like Jonathan Wild and Adam Worth — is a precursor to the contemporary psychopath as supervillain. Holmes's primary intellectual detection method is induction, which Holmes rather inaccurately calls deduction. "From a drop of water", he writes, "a logician could infer the possibility of an Atlantic or a Niagara without having seen or heard of one or the other". Holmes stories often begin with a bravura display of his talent for "deduction". It is of some interest to logicians and those interested in logic to try to analyse just what Holmes is doing when he performs his induction. "Holmesian deduction" appears to consist primarily of drawing inferences based on either straightforward practical principles—which are the result of careful inductive study, such as Holmes's study of different kinds of cigar ashes—or inference to the best explanation. One quote often heard from Holmes is "When you have eliminated the impossible, whatever remains, however improbable, must be the truth". It is simplicity itself ... My eyes tell me that on the inside of your left shoe, just where the firelight strikes it, the leather is scored by six almost parallel cuts. Obviously they have been caused by someone who has very carelessly scraped round the edges of the sole in order to remove crusted mud from it. Hence, you see, my double deduction that you had been out in vile weather, and that you had a particularly malignant boot-slitting specimen of the London slavey. If leather on the side of a shoe is scored by several parallel cuts, it was caused by someone who scraped around the edges of the sole in order to remove crusted mud. If a London doctor's shoes are scraped to remove crusted mud, the person who so scraped them is the doctor's servant girl. If someone cuts a shoe while scraping it to remove encrusted mud, that person is clumsy and careless. If someone's shoes had encrusted mud on them, then they are likely to have been worn by him in the rain, when it is likely he became very wet. "Watson's servant girl is clumsy and careless" and "Watson has been very wet lately and has been out in vile weather". Deductive reasoning allows Holmes to impressively reveal a stranger's occupation, such as a Retired Sergeant of Marines in A Study in Scarlet; a former ship's carpenter turned pawnbroker in "The Red-Headed League"; and a billiard-marker and a retired artillery NCO in "The Adventure of the Greek Interpreter". Similarly, by studying inanimate objects, Holmes is able to make astonishingly detailed deductions about their owners, including Watson's pocket-watch in "The Sign of the Four" as well as a hat, a pipe, and a walking stick in other stories. 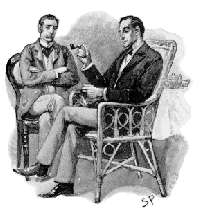 Yet Doyle is careful not to present Holmes as infallible—a central theme in "The Adventure of the Yellow Face". At the end of the tale a sobered Holmes tells Watson, “If it should ever strike you that I am getting a little over-confident in my powers, or giving less pains to a case than it deserves, kindly whisper ‘Norbury’ in my ear, and I shall be infinitely obliged to you”. Holmes displays a strong aptitude for acting and disguise. In several stories, he adopts disguises to gather evidence while 'under cover' so convincing that even Watson fails to penetrate them, such as in "The Adventure of Charles Augustus Milverton", "The Man with the Twisted Lip", "The Adventure of the Empty House" and "A Scandal in Bohemia". In other adventures, Holmes feigns being wounded or ill to give effect to his case, or to incriminate those involved, as in "The Adventure of the Dying Detective". Holmes and Watson carry pistols with them; in the case of Watson often his old service revolver. Watson describes these weapons as being used on seven occasions. Holmes, as a gentleman, often carries a stick or cane. He is described by Watson as an expert at singlestick and twice uses his cane as a weapon. In "A Study in Scarlet" Watson describes Holmes as an expert with a sword—although none of the stories have Holmes using a sword. It is mentioned in "Gloria Scott" that Holmes practised fencing. In several stories, Holmes appears equipped with a riding crop and in "A Case of Identity" comes close to thrashing a swindler with it. Using a "hunting crop", Holmes knocks a pistol from John Clay's hand in "The Red-Headed League". In "The Six Napoleons" it is described as his favourite weapon—he uses it to break open one of the plaster busts. Holmes engages in hand-to-hand combat with his adversaries on occasions throughout the stories, inevitably emerging the victor. It is mentioned also in "Gloria Scott" that Holmes trained as a boxer, and in "The Yellow Face" Watson comments that "he was undoubtedly one of the finest boxers of his weight that I have ever seen." In "The Adventure of the Empty House", Holmes recounts to Watson how he used martial arts to overcome Professor Moriarty and fling his adversary to his death down the Reichenbach Falls. He states, "I have some knowledge, however, of baritsu, or the Japanese system of wrestling, which has more than once been very useful to me". The name "baritsu" appears to be a reference to the real-life martial art of Bartitsu, which combined jujitsu with Holmes's canonical skills of boxing and cane fencing. In several stories, Holmes is described or demonstrated as having above average physical strength. As an example, in "The Adventure of the Speckled Band", Dr. Roylott, 6 feet tall and wide as a doorframe, demonstrates his strength by bending a fire poker in half. After the Doctor leaves, Holmes "said laughing. 'I am not quite so bulky, but if he had remained I might have shown him that my grip was not much more feeble than his own.' As he spoke he picked up the steel poker and, with a sudden effort, straightened it out again." In "The Yellow Face" Watson comments of Holmes, that "Few men were capable of greater muscular effort." In the first story, A Study in Scarlet, something of Holmes's background is given. In early 1881, he is presented as an independent student of chemistry with a variety of very curious side interests, almost all of which turn out to be single-mindedly bent towards making him superior at solving crimes. (When he appears for the first time, he is crowing with delight at having invented a new method for detecting bloodstains; in other stories he indulges in recreational home-chemistry experiments, sometimes filling the rooms with foul-smelling vapours.) An early story, "The Adventure of the Gloria Scott", presents more background on what influenced Holmes to become a detective: a college friend's father richly complimented his deductive skills. Holmes maintains strict adherence to scientific methods and focuses on logic and the powers of observation and deduction. Holmes also makes use of phrenology, which was widely popular in Victorian times but now regarded as pseudo-scientific: In "The Adventure of the Blue Carbuncle", he infers from the large size of a man's hat that the owner is intelligent and intellectually inclined, on the grounds that “a man with so large a brain must have something in it”. Knowledge of Literature – nil. Knowledge of Philosophy – nil. Knowledge of Astronomy – nil. Knowledge of Politics – Feeble. Knowledge of Botany – Variable. Well up in belladonna, opium and poisons generally. Knows nothing of practical gardening. Knowledge of Geology – Practical, but limited. Tells at a glance different soils from each other. After walks, has shown me splashes upon his trousers, and told me by their colour and consistence in what part of London he had received them. Knowledge of Chemistry – Profound. Knowledge of Anatomy – Accurate, but unsystematic. Knowledge of Sensational Literature – Immense. He appears to know every detail of every horror perpetrated in the century. Is an expert singlestick player, boxer and swordsman. At the very end of A Study in Scarlet itself, it is shown that Holmes knows Latin and needs no translation of Roman epigrams in the original—though knowledge of the language would be of dubious direct utility for detective work, all university students were required to learn Latin at that time. Later stories also contradict the list. Despite Holmes's supposed ignorance of politics, in "A Scandal in Bohemia" he immediately recognises the true identity of the supposed "Count von Kramm". Regarding nonsensational literature, his speech is replete with references to the Bible, Shakespeare, even Goethe. He is able to quote from a letter of Flaubert to George Sand and in the original French. Moreover, in "The Adventure of the Bruce-Partington Plans" Watson reports that in November 1895 "Holmes lost himself in a monograph which he had undertaken upon the Polyphonic Motets of Lassus"—a most esoteric field, for which Holmes would have had to "clutter his memory" with an enormous amount of information which had absolutely nothing to do with crime-fighting—knowledge so extensive that his monograph was regarded as "the last word" on the subject. The later stories abandon the notion that Holmes did not want to know anything unless it had immediate relevance for his profession; in the second chapter of The Valley of Fear, Holmes instead declares that "all knowledge comes useful to the detective", and near the end of "The Adventure of the Lion's Mane" he describes himself as "an omnivorous reader with a strangely retentive memory for trifles". Holmes is also a competent cryptanalyst. He relates to Watson, "I am fairly familiar with all forms of secret writing, and am myself the author of a trifling monograph upon the subject, in which I analyse one hundred and sixty separate ciphers". One such scheme is solved using frequency analysis in "The Adventure of the Dancing Men". Holmes's analysis of physical evidence is both scientific and precise. His methods include the use of latent prints such as footprints, hoof prints and bicycle tracks to identify actions at a crime scene (A Study in Scarlet, "The Adventure of Silver Blaze", "The Adventure of the Priory School", The Hound of the Baskervilles, "The Boscombe Valley Mystery"), the use of tobacco ashes and cigarette butts to identify criminals ("The Adventure of the Resident Patient", The Hound of the Baskervilles), the comparison of typewritten letters to expose a fraud ("A Case of Identity"), the use of gunpowder residue to expose two murderers ("The Adventure of the Reigate Squire"), bullet comparison from two crime scenes ("The Adventure of the Empty House"), analysis of small pieces of human remains to expose two murders (The Adventure of the Cardboard Box) and even an early use of fingerprints ("The Norwood Builder"). Holmes also demonstrates knowledge of psychology in "A Scandal in Bohemia", luring Irene Adler into betraying where she had hidden a photograph based on the "premise" that an unmarried woman will seek her most valuable possession in case of fire, whereas a married woman will grab her baby instead. Despite the excitement of his life (or perhaps seeking to leave it behind), Holmes retired to the Sussex Downs to take up beekeeping ("The Second Stain") and wrote a book on the subject entitled "Practical Handbook of Bee Culture, with Some Observations upon the Segregation of the Queen". His search for relaxation can also be seen in his love for music, notably in "The Red-Headed League", wherein Holmes takes an evening off from a case to listen to Pablo de Sarasate play violin. He also enjoys vocal music, particularly Wagner ("The Adventure of the Red Circle"). The film Young Sherlock Holmes (1985), which speculates about Holmes's youthful adventures, shows Holmes as a brilliant secondary school student, being mentored simultaneously by an eccentric professor/inventor and his dedicated fencing instructor. Unless indicated otherwise, the text in this article is either based on Wikipedia article "Sherlock Holmes" or another language Wikipedia page thereof used under the terms of the GNU Free Documentation License; or on original research by Jahsonic and friends. See Art and Popular Culture's copyright notice. This page was last modified 12:04, 27 November 2016.